This plugin is a premium version of free "All Currencies for WooCommerce" plugin. All Currencies for WooCommerce plugin adds all world currencies and crypto currencies to WooCommerce. WordPress Multisite compatible. There is also options to add your own custom currencies. 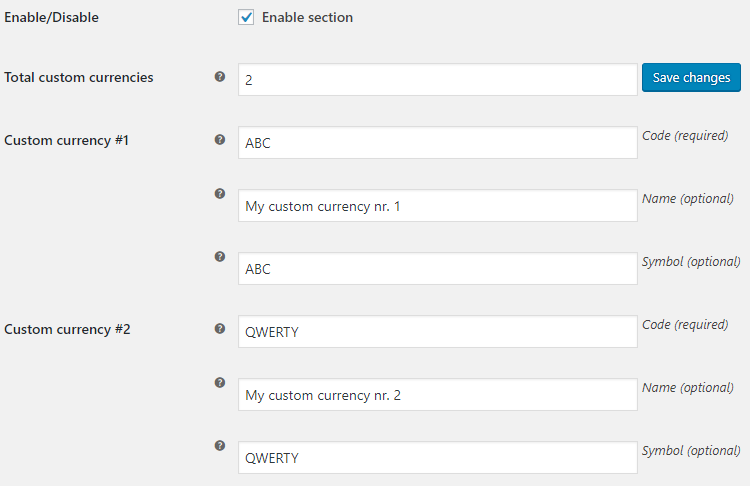 Currencies will be added to WooCommerce > Settings > General. 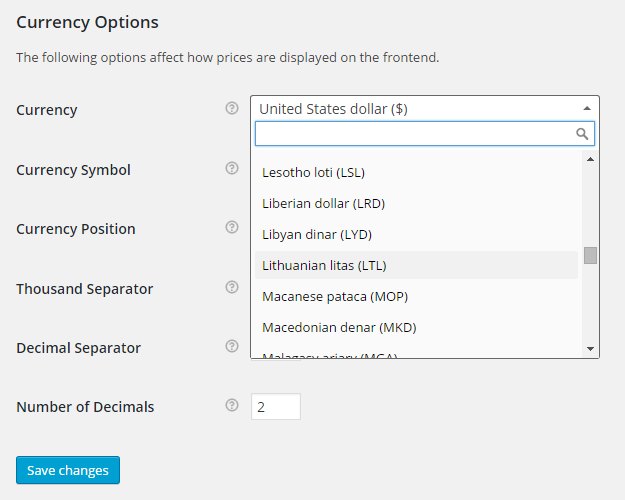 There is also an options to change symbol for any currency, or to hide currency symbol from frontend completely. Afghan afghani, Albanian lek, Algerian dinar, Angolan kwanza, Argentine peso, Armenian dram, Aruban florin, Australian dollar, Azerbaijani manat, Bahamian dollar, Bahraini dinar, Bangladeshi taka, Barbadian dollar, Belarusian ruble, Belize dollar, Bhutanese ngultrum, Bolivian boliviano, Bosnia and Herzegovina konvertibilna marka, Botswana pula, Brazilian real, British pound, Brunei dollar, Bulgarian lev, Burundi franc, Cayman Islands dollar, Cambodian riel, Canadian dollar, Cape Verdean escudo, Central African CFA franc, Central African CFA franc, CFP franc, Chilean peso, Chinese renminbi, Colombian peso, Comorian franc, Congolese franc, Costa Rican colon, Croatian kuna, Cuban peso, Czech koruna, Danish krone, Djiboutian franc, Dominican peso, East Caribbean dollar, Egyptian pound, Eritrean nakfa, Estonian kroon, Ethiopian birr, European euro, Falkland Islands pound, Fijian dollar, Gambian dalasi, Georgian lari, Ghanaian cedi, Gibraltar pound, Guatemalan quetzal, Guinean franc, Guyanese dollar, Haitian gourde, Honduran lempira, Hong Kong dollar, Hungarian forint, Icelandic króna, Indian rupee, Indonesian rupiah, Iranian rial, Iraqi dinar, Israeli new sheqel, Yemeni rial, Jamaican dollar, Japanese yen, Jordanian dinar, Kazakhstani tenge, Kenyan shilling, Kyrgyzstani som, Kuwaiti dinar, Lao kip, Latvian lats, Lebanese lira, Lesotho loti, Liberian dollar, Libyan dinar, Lithuanian litas, Macanese pataca, Macedonian denar, Malagasy ariary, Malaysian ringgit, Malawian kwacha, Maldivian rufiyaa, Mauritanian ouguiya, Mauritian rupee, Mexican peso, Myanma kyat, Moldovan leu, Mongolian tugrik, Moroccan dirham, Mozambican metical, Namibian dollar, Nepalese rupee, Netherlands Antillean gulden, New Taiwan dollar, New Zealand dollar, Nicaraguan cordoba, Nigerian naira, North Korean won, Norwegian krone, Omani rial, Paanga, Pakistani rupee, Panamanian balboa, Papua New Guinean kina, Paraguayan guarani, Peruvian nuevo sol, Philippine peso, Polish zloty, Qatari riyal, Romanian leu, Russian ruble, Rwandan franc, Saint Helena pound, Samoan tala, Sao Tome and Principe dobra, Saudi riyal, Seychellois rupee, Serbian dinar, Sierra Leonean leone, Singapore dollar, Syrian pound, Slovak koruna, Solomon Islands dollar, Somali shilling, South African rand, South Korean won, Special Drawing Rights, Sri Lankan rupee, Sudanese pound, Surinamese dollar, Swazi lilangeni, Swedish krona, Swiss franc, Tajikistani somoni, Tanzanian shilling, Thai baht, Trinidad and Tobago dollar, Tunisian dinar, Turkish new lira, Turkmen manat, UAE dirham, Ugandan shilling, Ukrainian hryvnia, United States dollar, Uruguayan peso, Uzbekistani som, Vanuatu vatu, Venezuelan bolivar, Vietnamese dong, West African CFA franc, Zambian kwacha, Zimbabwean dollar. Auroracoin, Binance Coin, Bitcoin, Bitcoin Cash, Bitcoin Token, BitConnect, Cardano, Coinye, DigitalNote, Dragonchain, Emercoin, EOS, Ethereum, Ethereum Classic, Freemasoncoin, Gridcoin, Huobi Token, IOTA, Litecoin, Marscoin, MazaCoin, Monero, Namecoin, NEM, Nxt, Omni, PACcoin, Peercoin, PotCoin, Primecoin, Ripple, SixEleven, SmartCash, Stellar, Synereo AMP, Tether, Titcoin, Ubiq, Vertcoin, Zcash. Adds country currencies to WooCommerce. Adds crypto currencies to WooCommerce. Sets current WooCommerce currency symbol. In case if you have multilanguage site – you can optionally use [alg_wcac_lang] shortcode here (for more information with examples please check Tips & Tricks section below). If enabled will display currency code (e.g. USD) instead of currency symbol on frontend. If enabled will hide currency code on frontend. This section allows you to change symbols for country currencies. This section allows you to change symbols for crypto currencies. This section allows you to add any number of custom currencies to WooCommerce. Sets number of total custom currencies you wish to add. Save settings to see new options fields. 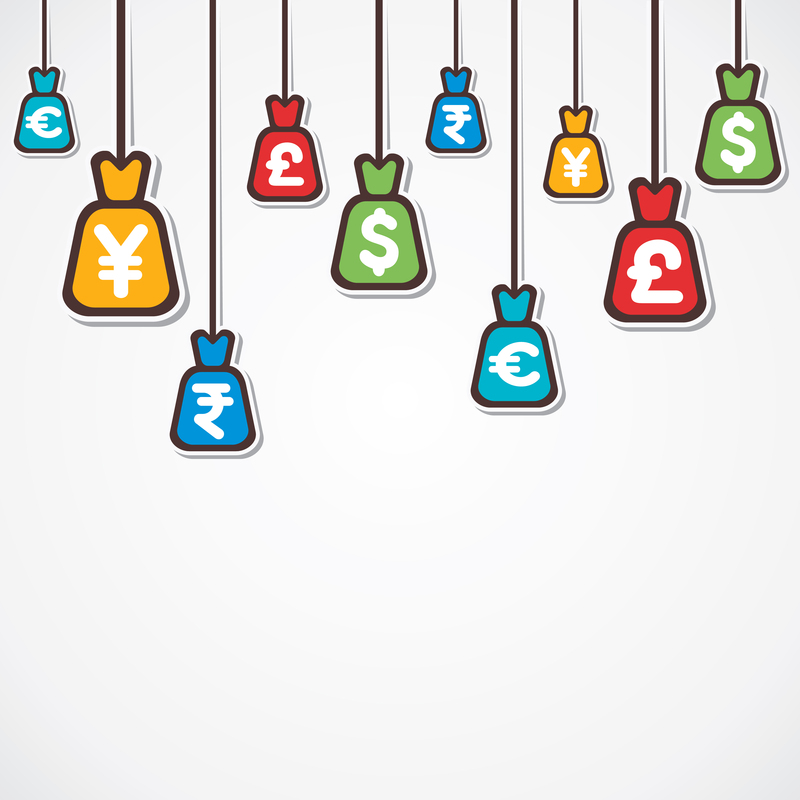 With this plugin you can set different currency symbols for different languages (i.e. 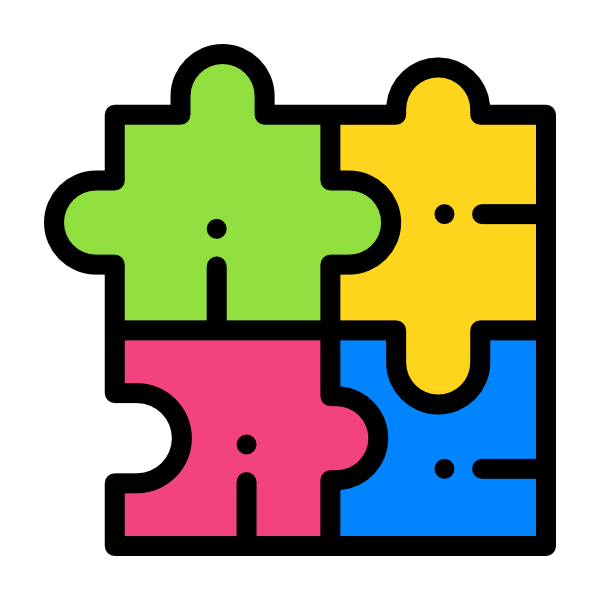 WPML, Polylang plugins). You just need to use our [alg_wcac_lang] shortcode in currency symbol settings field. There is a free version of this plugin, please check it out, if you haven’t already done so. Is it compatible with WPML? Means if I set United Arab Emirates currency symbol AED in English, can I set د.إ for Arabic version? Nice little plugin and good support. 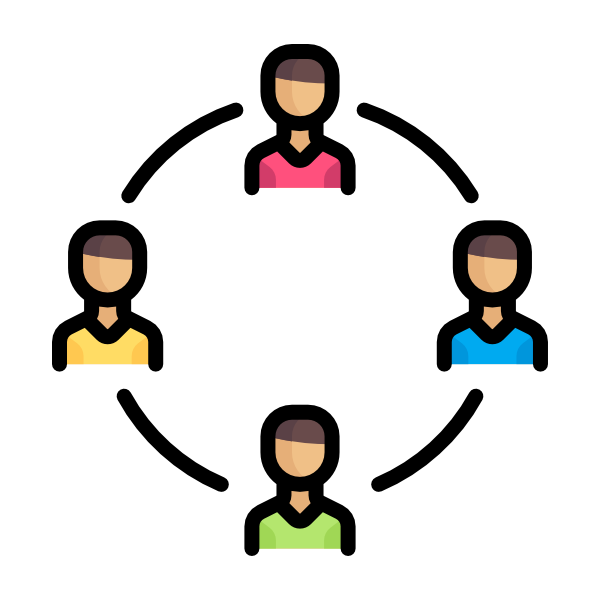 16 thoughts on "All Currencies for WooCommerce"
Unfortunately I’m not sure I fully understood the issue – you can change the currency symbol from BTN to Nu (or any other) in plugin’s settings (WooCommerce > Settings > Currencies Pro > All Currencies). A pre sales question here. When you change the currency, will a payment gateway like paypal or 2checkout recognize the currency or will it treat the currency as default when checking out. Payment gateways will treat currencies as you set it, that is “Frs” in your example. However you should check if your currency is supported by PayPal. If it’s not – WooCommerce will just hide PayPal gateway from your customers. I’m not 100 percent sure, but I think PayPal supported currencies are: AUD, BRL, CAD, MXN, NZD, HKD, SGD, USD, EUR, JPY, TRY, NOK, CZK, DKK, HUF, ILS, MYR, PHP, PLN, SEK, CHF, TWD, THB, GBP, RMB, RUB. Hope I made it a little more clear. Please let me know if you have any questions. I have installed and activated the free version of this plugin but I cant find it in my wordpress dashboard, what could be causing this? Plugin settings should be in “WooCommerce > Settings > Currencies” in your admin dashboard. Could you please recheck if it’s there? Yes, I’ve just re-checked it on my test server with WooCommerce v3.3.0 installed – there seems to be no issues, plugin is working fine. Hi, please confirm if this plugin support WPML? Please confirm, so I will buy it. I will purchase this plugin if it supports more crypto currencies. It’s missing some cryptos from the top 10 like EOS. Do you have any update coming for this? Thanks! Sure, no problem. We’ve just released new plugin version 2.2.0, where we’ve added EOS (as well as some other cryptocurrencies). 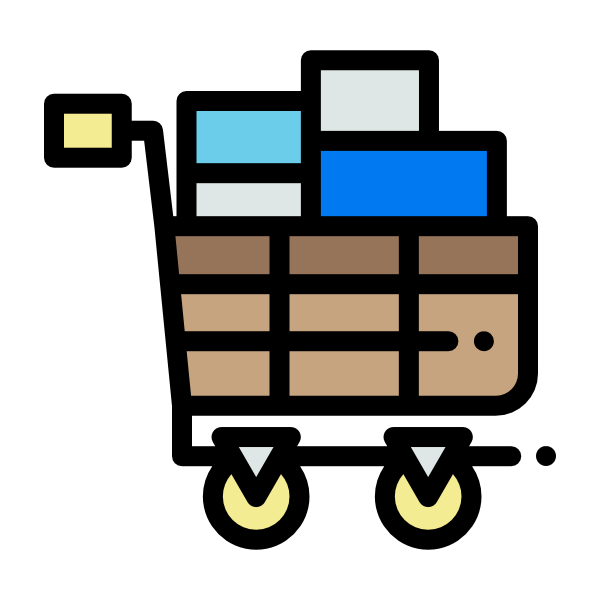 Hi, i have version Version 2.0.2 of All Currencies for WooCommerce Pro installed. How can i display the currencies on my header? Does this plugin support mobile app? Or is there any APIs are available? Does this plugin support multi vendor websites created with Dokan or Product Vendors? * Fix - delete_option() added to version_updated(). * Dev - [alg_wcac_lang] shortcode added. * Dev - Cryptocurrencies - Huobi Token (HT) added. * Dev - Cryptocurrencies - Binance Coin (BNB) added. * Dev - Cryptocurrencies - Cardano (ADA) added. * Dev - Cryptocurrencies - EOS (EOS) added. * Dev - Cryptocurrencies - PACcoin (PAC) added. * Dev - Cryptocurrencies - SmartCash (SMART) added. * Dev - Cryptocurrencies - Stellar (XLM) added. * Dev - Cryptocurrencies - Tether (USDT) added. * Dev - "Custom Currencies" section added (Pro). * Dev - Settings are saved in array now. * Dev - Admin settings restyled, descriptions updated and custom CSS removed. * Dev - Cryptocurrencies - Bitcoin Token (BTK) added. * Dev - Cryptocurrencies - Marscoin (MARS) added. 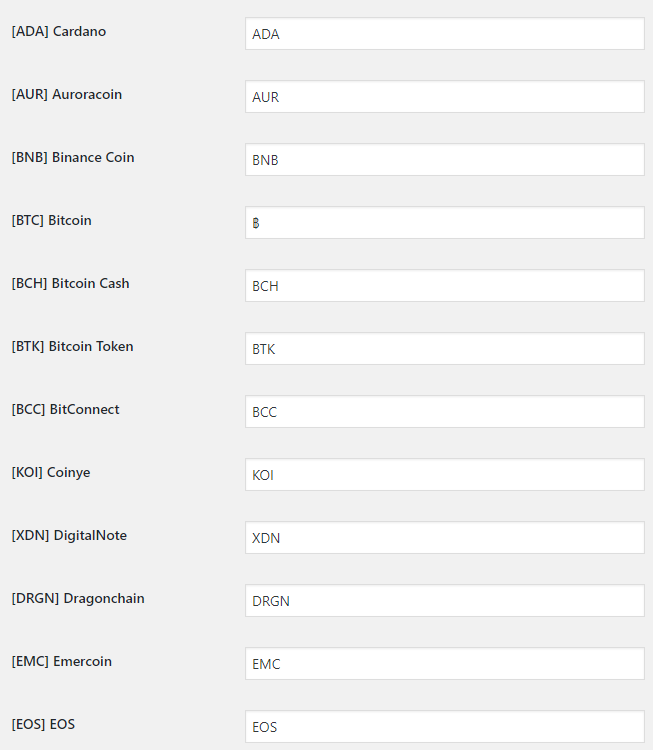 * Dev - Cryptocurrencies - Dragonchain (DRGN) added. * Dev - "WC tested up to" added to the plugin header. * Dev - Cryptocurrencies - Bitcoin Cash (BCH) added. * Dev - "Use Currency Code as Symbol" option added. * Dev - "Country Currencies" and "Crypto Currencies" divided in separate sections. * Dev - Cryptocurrencies added. * Dev - Default currency symbols list updated. * Dev - "Reset settings" admin options added. * Dev - Plugin version system added. * Dev - Plugin description and headers updated (readme.txt etc.). * Dev - Plugin link updated (from http://coder.fm to https://wpcodefactory.com). * Dev - Translation (POT) file added. * Dev - Multisite support added. * Fix - Plugin link fixed. * Fix - Settings link in plugin's action_links fixed. * Fix - Lao kip currency code fixed. 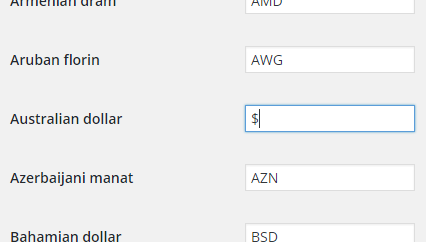 * Fix - "All Currencies" list settings: default symbols are now set same as WooCommerce defaults. * Dev - Plugin renamed from "WooCommerce All Currencies" to "All Currencies for WooCommerce". * Dev - Hide currency symbol option added. * Dev - Major code refactoring. Settings are split in two sections: General and All Currencies. * Fix - Minor bug fixed.